Safety for bicyclists in the road is becoming a great concern nowadays. Cyclists are getting involved in accidents on a higher rate in the evenings due to one reason: poor visibility. There has to be a way to stop this. Luckily, there is. Greenclick COB Waterproof powerful Lumen is a taillight packed with features and engineered with safety as the priority. It has a waterproof rating of IPX6, which is very high in standards of waterproof tail lights. It can easily withstand moderate to mid harsh rain. So, you can drive in the rain without worrying about going unnoticed. The Greenclick COB Waterproof powerful Lumen has a 600mAh battery which will help it run for atleast 13 hours on a single charge. It emits four types of lighting, full-beam, slow blinking, fast blinking and half beam, so you choose what intensity of light you want to flash. With this much power, what is very surprising is its weight. It weights a bare minimum of 60 grams gross and 35 grams net. It also comes with the ability to rotate 360 degrees, which is some kind of versatility rarely seen on taillights. When you charge this product for two hours it stays on 100% Steady ON for 3.5 Hours, 50% Steady ON for 7 Hours, Slow Flash for 13 Hours and Fast Flash for 11 Hours, Flash Red and Blue for 14.5 Hours. This is a high standard for taillights. You can even go as far and say this taillight is a monster. A humble monster, in fact. It is also highly visible in the day, if you so choose to use it in the day. If you are looking to accessorize your bicycle, this must be in your list. Very few accessories offer this much safety. The light also comes with lighting that can be seen from 980 feet away, which is higher than the distance needed for breaking. It has a strong battery and it will last at least hundreds of recharges. The light also flashes different colours, like blue, green and multicolour, that adds style to this accessory. This taillight is a lifesaver. For all cyclists who are afraid to drive in the nights because of being unnoticed, this is the best solution there is. You just have to install these and start riding worry free. These lights come with so many modes that its hard being unnoticed at all. Overall, it is a great and very useful accessory for your bicycle. Is this light for bicycles only? No. These lights are for anyone who is walking or cycling in the night. Visibility is a great deal in the night, be it people who walk or cycle. So, we have included a silicone band which will help you fit it at the back of your head. These bands make the taillight a versatile accessory to use in the night. Is it complicated to use this light? No, using this taillight is a pretty straightforward and simple work. You will be able to figure it out the moment you unbox these. You just have to charge the lights with the included cables and this tiny taillight will pretty much run on autopilot. The clip will buckle itself to the bar on your bicycle. Yes. As we mentioned earlier, this light is waterproof. It can withstand light to moderate intensity of rain with no problem. But we recommend that you do not take it for liberty, as sometimes it may malfunction. It can take splashes of water easily and you don’t have to worry about that. Since the light is pretty bright, you must avoid looking at it directly, as it may result in blindness. You should also remember to charge this accessory whenever it is possible, because if this device turns off, the possibility of you being involved in road dangers soar up. These devices require minimal care, but occasionally remember to wipe it thoroughly. 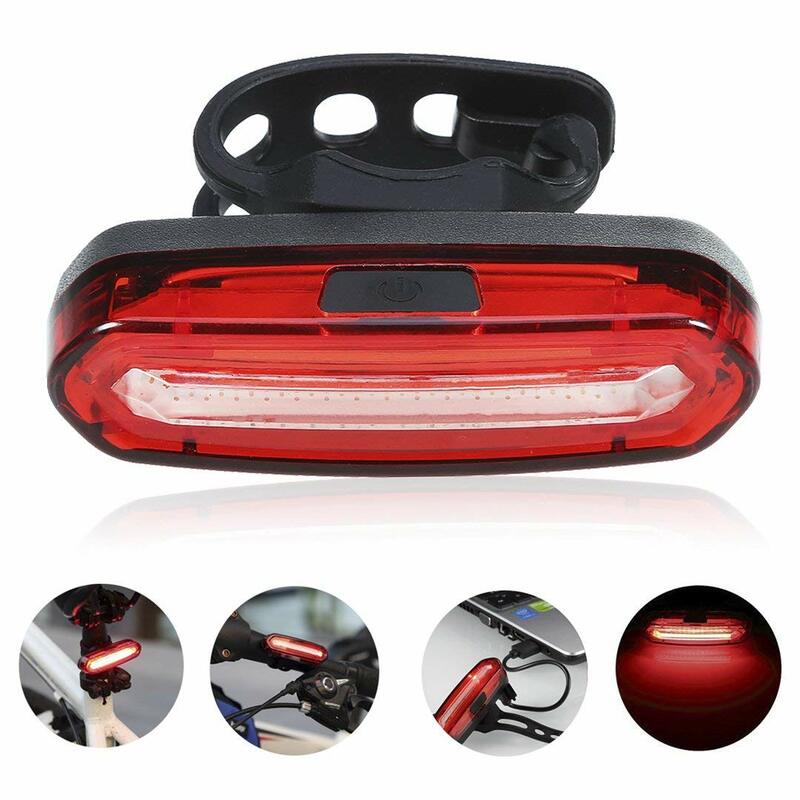 It is a cool accessory that flickers light and adds style to your bicycle.